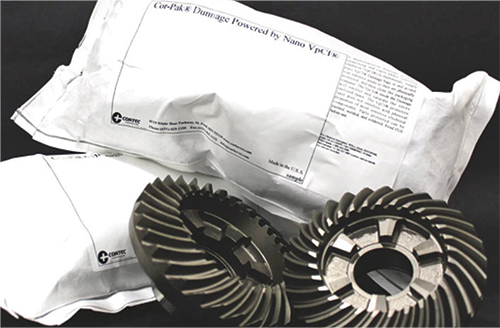 Cortec, St. Paul, MN, has introduced its Nano VpCI corrosion-inhibiting technology, available in the form of a cushioned dunnage bag. The bags ensure that metal-part shipments arrive at their destinations corrosion- and nick-free. In addition, Cor-Pak dunnage bags reportedly have an excellent environmental footprint, with active VpCI content that is more than 95-percent recycled. Cor-Pak dunnage bags emit VpCIs through a breathable Tyvek pouch, packed with cushioning material such as neutral Kraft paper or polyurethane foam impregnated with VpCIs. These corrosion inhibitors vaporize and condense on metal surfaces to form a thin protective layer that does not alter product appearance and does not need to be removed. It will not harm the physical properties of even the most sensitive electrical components. And, the metal parts protected by dunnage bags can be painted, welded and soldered without removing the VpCI. Cor-Pak VpCI bags are nontoxic and provide superior multi-metal corrosion protection without using nitrites, phosphates or silicates. They prove effective against aggressive environments including humidity, SO2, H2S and galvanic corrosion from dissimilar metals. They come as 6- by 12-in. pouches packaged 30 per carton, with custom sizes available upon request.